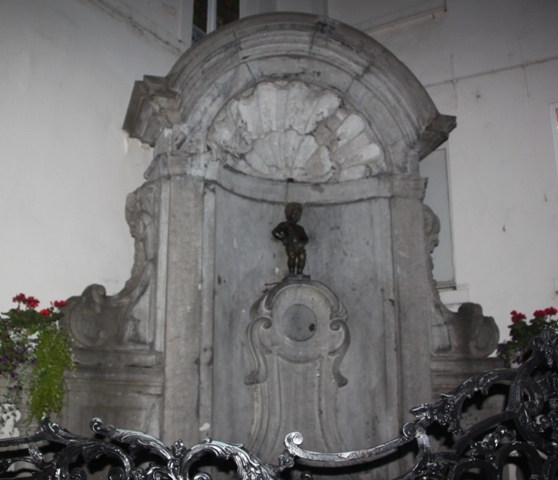 “Tourist trap”, “over-hyped and over gawped at statue”, “not worth it – one of the top ten things to avoid”, all stuff I read about the Manneken Pis pre-trip. However we couldn’t go to Brussels and not seek him out. As it happens this little guy (along with waffles and chocolate) was one of Son’s Belgium highlights. 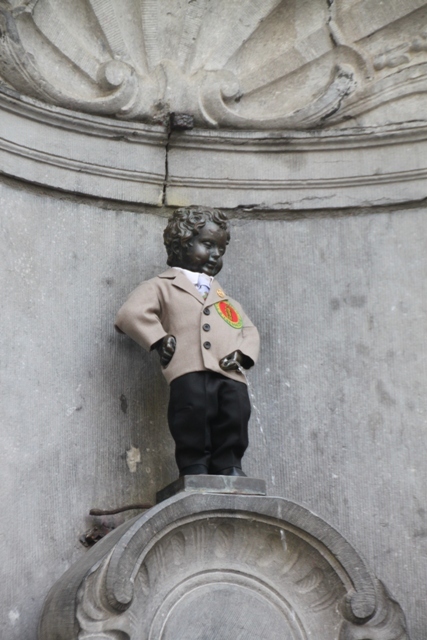 In fact on our first evening in Brussels so keen was he to make his acquaintance with the Manneken Pis that the splendours of the Grand Place went over his head somewhat and he rushed us along to find the peeing boy. The fountain is a bit hit with children (and adults), you can’t escape his image in Brussels and plenty of other places in Belgium. We knew we were heading in the right direction, the closer we got, the more peeing boys started to appear in shop windows advertising everything from chocolate to waffles to beer. Quite easy to find, just a couple of blocks south of the Grand Place we got there on a Friday evening around 9.30 pm. Not too many people at all and we were able to get close. The cherub is pretty small and is perched on a little niche. He pees away night and day with a bit of a cheeky grin on his face. Legends abound but I like the one that says he peed to put out a burning fuse of a bomb which was going to blow up the Grand Place. 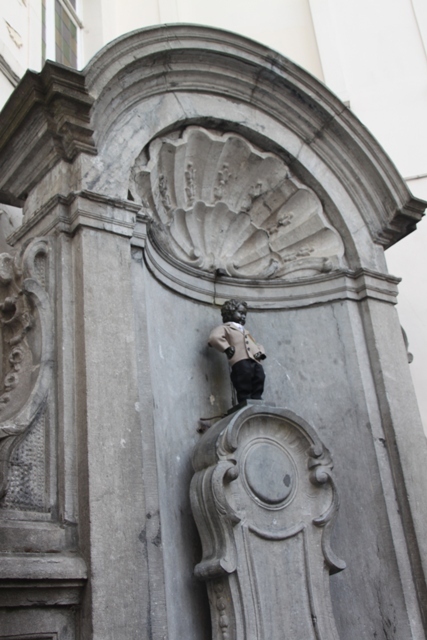 A tradition, dating back to the seventeenth century, is to present the Manneken Pis with clothes. Apparently he has all sorts of outfits – over seven hundred and some are displayed in the City Museum. Son was keen to go back and see him again next morning, we obliged. More crowded than in the evening but we had no issue getting close for pictures. A nice surprise – he was all dressed up in a natty suit – apparently they dress him up every Saturday. Son was more than thrilled to see this and more than thrilled to come away boasting he had seen the Manneken Pis with and without clothing. A quick trip to one of the (many) souvenir shops nearby, Son was super keen to acquire his own miniature Manneken Pis souvenir. A trip tradition for us, he always brings back something from each city/country we visit for his “treasures” shelf. 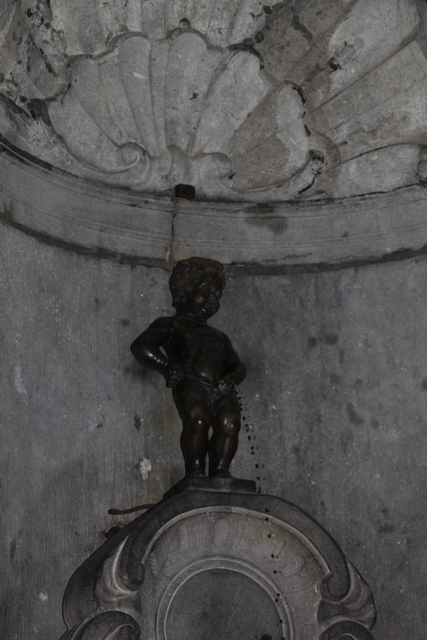 How could I not have guessed a peeing boy would be his abiding symbol and memory of Brussels! I didn’t know there was a lady version!! Have to check that out, we missed that!! how weird that they dress him up every week- quite a cool ensemble! It was fun to see him all dressed up in his suit and tie!! Apparently he has plenty more costumes too! With a young son, of course you had to go see this! It makes me think of the Molly Malone statue in Dublin–a favorite with male tourists because her dress is cut so low! Been up close with Molly as well – she’s a lot of fun too!! Tourist trap or not, you have to see the peeing boy, and such a bonus that they dress him up! Lol. He’s great – we loved him so much we went back twice. Wouldn’t mind seeing him again in another of those cool outfits! I’m confident that the Manneken Pis would be the highlight of a trip for my boys too. There’s just something about a peeing boy that appeals to boys!! I agree Suzanne, watching other people’s reactions to the little guy was as good as watching him! He looks very smart, I hope he doesn’t dribble down his trousers! Not a dribble in sight – his aim was good! Funny, we were just talking about Manneken Pis. We saw him in Brussels several years ago with our adult sons on holiday when they were in college. We were reminded of him recently in Vancouver when we saw a fountain spouting water but from the mouth. I love the outfit! That sounds like a fun fountain too! We loved the novelty value of dressing a little statue up in a different suit every Saturday – how much fun is that! We got the naked version – sitting happily on Son’s shelf!! Glad to see him all decked out in his finery too though, that was fun. It’s such a great statue – cool too that he gets dressed up and with 700 outfits more than spoilt for choice. Just the type of thing that appeals to me!! Learn something every day! The food displayed under the chocolate peeing boy doesn’t look too appetizing!!!! It looks like it’s been there a while – didn’t see any takers and no surprise at that!! Definitely worth the trip and to see him dressed up and peeing, well that makes it all the more enjoyable. That’s pretty funny, actually. He’s great isn’t he George – that suit just makes me laugh everytime!! We are so into equality here in the north 😉 that I have to ask if you saw the Jeanne pis too? I never even knew she existed!! So cross about that – just googled her and we’re still laughing! Have to go back for that sometime. I love that your son gets to choose his own souvenirs… Our little people have a random (to us) collection of objects that are deeply meaningful to themselves! Each one is selected with great care. For me, that’s part of what makes travelling so inspiring – we each get something different out of it, and the talismans the children choose are often the most interesting. We return from our journeys transformed, and those little mementos inspire us to remember the moments as we resume our daily life…busily saving up until we can do it all over again! We have quite the selection of things – like you said random to us but choosing them is all part of his holiday process!! The first thing he picked was a tiny Eiffel Tower from street vendor, it just grew from there – we even have stones from some places. So intriguing and like you say fun to look at them and reminisce. His outfits are great – such a cool idea, we loved seeing him in all his finery (and without his clothes too!!). The chocolate waffles come highly recommended – that comes from quite the expert who sampled more than his fair share!! When we visited Brussels one Christmas, the wee boy had a snazzy Santa outfit on! Now that would be well worth seeing!! A peeing Santa – I would love to visit the Christmas markets in Brussels sometime, have to be sure to look out for the boy in his Christmas gear!! He might be a tourist trap but at least he’s free and easy to see! I’m disappointed that he wasn’t dressed up when we went! Seems like it is Saturday you can seem him in all his finery – we didn’t know this in advance but were glad to see him in his suit and tie!! He’s a lot of fun too I think. So true Melissa – they almost put me off, glad they didn’t, this little guy was such fun!! We knew he got dressed up sometimes but not when – just glad we managed to catch him with clothes – lots of fun!! Glad you enjoyed the beer and waffles – we loved those sooo much too!! Lovely story! I missed him when I travelled through Belgium… another time maybe. Definitely check him out if you’re back in Brussels Susan, he’s a fun diversion and even better when he’s all dressed up!! The suit and clothes is a great touch Rosemary – such a lot of fun, I was so pleased we managed to see him in his finery!! Apparently next week is going to be scorching, I’ll believe it when I see it though…. you know what the great British summertime can be like, never trust the forecasters until it is actually here… still fingers crossed!! Thanks for this episode! My father brought home a souvenir of the boy after his WWII service in Belgium and it was around our house for years. Somewhere along the line it disappeared. On my one trip to Brussels 20 years ago, I didn’t get to see him. Instead we spent all our time at a huge and moving exhibit commemorating 50 years from the end of WWII called: “En 1945 j’avais vingt ans” (In 1945 I was twenty); Belgium had suffered horribly during the war. Oh that’s a shame the little Manneken went missing, glad we’re not the only ones to choose him as our souvenir Bunty. The exhibition sounds incredible – right up my street. Later on in this trip we spent a few days exploring Flanders and the battle sites as well as a visit to the war graves – it really brought home the horrific events of the war years but was fascinating too. I know it is tiny – first time I saw it I was shocked!! This time I was prepared. It’s a bit like the Little Mermaid in Copenhagen – that is really small too. How funny that we enlarge famous icons in our heads before we see them! I too was surprised at how small our Belgian boy was, but saw him dressed in a natty, wet weather outfit so that made a visit worthwhile. We should expect The Little Mermaid to be small – clue is in the name – and I thought she was very pretty. Saw Molly Malone just a couple of weeks ago in Dublin – the “tart with a cart”, as the locals call her is fairly large but does she ever look miserable! Small or not we very much enjoyed making his acquaintance – especially in his suit!! The wet weather outfit sounds great too. Last year when we were in Dublin Molly was away having “work” done – so we missed her!! We always seek her out when we’re there. They have a replica manneken pis at a station in Tokyo, dress him up daily and all. So funny there is another dressed up to the nines little peeing boy – in a station too!! We were told Molly was being overhauled – we missed her on that trip!! And they dress him up so well – I’m surprised he’s not a super star!! Molly looks most beautiful in the snow. Thank you for making me think of her. I have fond memories of meeting friends there.